Heavy fighting has continued in northern and eastern parts of Sri Lanka. Many foreign nationals trapped by the fighting in the north were evacuated on Sunday. Here, a Sri Lankan aid worker who stayed behind describes the conditions for people displaced in the Jaffna peninsula. I have stayed here to help with the displaced. I am in the Chavakachcheri division of the Jaffna peninsula. Conditions are hard for these people. For three weeks, there has been a more or less continuous exchange of shelling of varying intensity. People have been coming from coastal fishing villages, fleeing the heavy bombing. There are very many of them. Nobody has been able to move about freely because of curfews, so nobody can leave this area now. Many want to move further north and some people have told me they want to go to the Tiger-controlled Vanni territory. 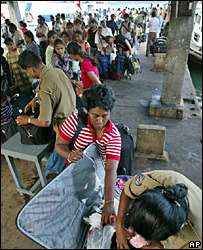 They are afraid of being close to the military bases of the Sri Lankan army. They are frightened of the fighting and the bombings. The majority of displaced people converge in one location in the evenings because of this. Even those who are not displaced and who live close by spend the night in these camps. During the day, those people return home to cook, go to the toilet and bathe. But such daily needs are not available for the displaced. Most people find their own food and cook it on-site. But food stocks are limited and shops are closed. There are very few toilet facilities and certainly no separate toilets for women. People have to make do outside and the odour of urine is noticeable. Lack of soap and limited water means people don't wash their hands. All of this means sanitation is a major concern and a potential health risk. We have also found a few children who were separated from their families in the panic of the blasts they were fleeing from. All of these people are very emotionally stressed. Many have witnessed people killed and injured by the shelling and bombing. And there is constant activity. On Monday night, a convoy of military troops with tanks, lorries and buses were on the move further north. From my house, I could see the convoy movement. Later, we heard reports of fierce fighting in a nearby district. Our curfew was not lifted and we were tied down to one spot for the entire day.